A man pedals a bicycle through stagnant water after a downpour at Lake View Estate in Bamburi, Mombasa County, October 12, 2015. Kenya Meteorological Department predicted the high likelihood of significantly above normal rains for the coming short and long rain seasons as a result of El Niño. PHOTO | LABAN WALLOGA | NATION MEDIA GROUP. In the run-up to El Niño, there has been a wide range of reactions to the advice of our meteorological services. These reactions have mirrored changes in Kenyan society, and if there is any failure to prepare for what may come, it will certainly not be the fault of our weather forecasters. Kenya Meteorological Department predicted the high likelihood of significantly above normal rains for the coming short and long rain seasons as a result of El Niño. In the last two weeks, I have been party to a number of interesting discussions on this topic. On a workplace balcony as staff take tea, discussion moves from a social catch-up to El Niño. One colleague asks another what measures she has put in place in anticipation of the rains. She says that she has cleared her drainage system, cleaned the rain water harvesting gutters and repaired ditches around her house. So, what can we learn from these (and other) discussions and scenarios about our preparedness? 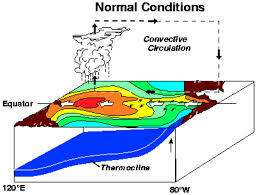 Kenya last experienced the El Niño phenomenon in 1997. A few weeks ago the county government of Nairobi launched an ambitious plan to recruit large numbers of casual workers to unblock drainage channels. This discussion changes one week later with a group of residents in Nyeri County. One woman in particular exemplifies how the weather forecasters’ advice can fall on deaf ears. A water supply technician has come to examine issues with local water supply and asks her about the plans she has ahead of the heavy rains. The woman argues that she is not worried. For her, “God is in charge.” The Met office, she says, may predict the rains, but God decides our fate. We have seen how the varied communication channels — mainstream and social media — employed by the Kenya Meteorological and other departments have effectively disseminated an awareness of the heavy rains and its impact. The efficacy of these messages could be measured by the level of concern of most Kenyans. It is also interesting to map out how the changing means of communication are matching the changing reactions to the information. The traditional narrow focus on saving lives is a dangerous reaction to this kind of information, yet it persists. Many Kenyans instantly think msaada (help) is the first line of defence against the El Niño. They don’t recognise how their own livelihoods and actions can be their true source of defence. But times are changing and there are those who want information to better manage their homes and businesses from the impact of heavy rainfall – or even too little rainfall. These actions are not limited to individuals. For a long time now, there has been a tendency to compartmentalise disaster preparedness by separating disasters and development. That is changing as we recognise preparing for bad times is as much part of life as preparing for the good times. The ultimate advantage of taking early action is that there are no regrets whether or not big rains come.